"Well hello there! My name is Suki." "Aren't I beautiful? Silly question - of course I am! I am a 4 year old black and while calico girl, and I have been hanging out with the great folks at Wayside since June 23rd. But I'm so looking forward to finding my forever home. I will need a quiet home without kids. I do love kids but I need a calm environment. You see, I can get stressed out sometimes. I love attention and really like being petted. Wouldn't you like to? I have black ears and the cutest brown nose. And even though I like a quiet home, I still love to explore, and check everything out. Just ask Jen! Please come down and see me - soon? Suki is available for adoption today at Allie's Alma Mater, Wayside Waifs. 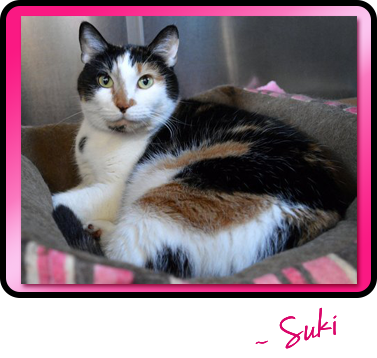 Suki, you sound like SUCH a sweet girl! What a beautiful face! You sound like you'll make a great family member, Suki! We hope your forever family finds you soon. Good luck sweet Suki we hope things work out for you. Have a wonderful Wednesday. You are absolutely gorgeous, Suki! what a cutie....we love those calico colors!! You are a pretty girl Suki. Suki you are beautiful! Purring that you find your new furrever home soon!